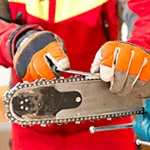 Unlike a basic hand-operated saw that features only a handle and a serrated blade, chainsaws require a bit more care. Taking good care of your chainsaw will maintain performance, help it perform more safely, and extend the life of your saw. Following daily, weekly, and monthly maintenance routines will ensure you're not missing anything important. 1. Test the Trigger: Check your throttle trigger before each use to make sure it's operating smoothly. If the throttle trigger is sticking, or the engine is not returning to idle after you release the trigger, take the saw into a service center for inspection. 2. Monitor Safety Features: Any safety features, such as the throttle trigger lockout and chain brake, should be monitored. Keep the chain brake clean, and check the chain catcher for damage. If it's damaged, replace it immediately. 3. Keep a Clean Filter: Check your saw's air filter before each use. If it's dirty, clean it off and allow it to dry before reinserting it into the saw. If it's damaged or excessively dirty, replace it with a new filter. 4. Rotate the Bar: For more even wear on the chainsaw bar, turn the bar before each use. Clean out the bar groove to prevent excessive wear, and inspect the lubrication hole to make sure it's not clogged with anything. Not getting enough lubrication will cause more friction and damage to the bar and the chain. 5. 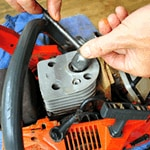 Check Sprocket / Tighten & Sharpen Chain: Inspect the drive sprocket for wear. If it's noticeably worn, replace it. Sharpen your chain, inspect its condition, and replace it if damaged. Check the chain tension to make sure it's not too loose, and tighten it if necessary. When sharpening, refer to your owner's manual to determine what size file to use for your chain. 6. Spoil Your Starter: Look for damage or excessive wear to the starter and the starter cord. If at all damaged, have it serviced. Clean the air intake slots located on the starter housing. Test the emergency stop switch to ensure it works properly. The engine should shut off immediately. 7. Tighten Any Loose Parts: With the vibration created by the engine, some screws, nuts, or bolts may shake loose. Inspect your saw for loose parts before each use and tighten them. 1. Anti-Vibration Wear & Tear: Take a look at the anti-vibration elements to make sure they're not getting too soft or torn. 2. Lube the Clutch: Lubricate the clutch drum bearings. This will prolong the life and performance of your clutch. 3. Inspect the Bar: Remove your saw's chain and run your finger around the edge of the chainsaw bar to feel for burrs. If you locate any, file them until they're gone. 4. Check Your Plugs: Remove and clean your spark plug, and ensure that the spark plug gap is still 0.5 mm. If necessary, replace the your spark plug with a new one. 5. Study Your Starter: Clean the flywheel fins, and make sure the recoil spring is functioning properly. 6. Wipe Your Fins: Clean off the cooling fins that are located on the cylinder to ensure proper heat distribution and cooling. 7. Cleanse the Carburetor: Clean your carburetor and your air box. Check the screen in your saw's muffler. Clean it off or replace it as necessary. 1. Chain Brake Band: Remove the plastic cover to the bar and chain, and inspect the chain brake band. this is the thin metal band that wraps in a circle around your clutch drum. Make sure there are no cracks or visible weak spots on the band, especially where it attaches to the mechanisms near the front of the saw. If the brake band breaks, you'll need to replace it. 2. Check the Clutch: While you still have the cover off, inspect the clutch. Inspect for wear on the center of the clutch, the clutch drum, and the spring. 3. Examine Your Fuel Filter: Check your fuel filter, and clean it or replace it as necessary. Clean off the outside of your carburetor. 4. Survey Your Wiring: Check all of your wiring, cables, plugs, and anything else you can access to make sure everything's connected properly. 5. Clean Your Tanks: Now is also a good time to clean the inside of your fuel tank. Old gasoline can leave a gunky residue that's bad for your engine. You can also take a moment to clean your oil tank if you'd like. Keep it Cutting.. Our Power Equipment Direct how-to library can help you learn about Tips for Starting Your Gas or Electric Chainsaw, Benefits of Corded and Cordless Chainsaws and Proposition 65 Product Labeling.